Description: Yellow Wolf was one of the last surviving participants of the Nez Perce War. This is his story of the hitherto unrevealed Indian strategy and policy in that conflict as told to L.V. McWhorter, his friend for decades. 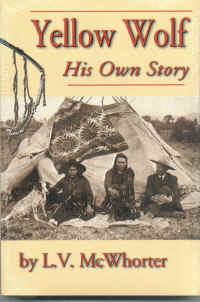 McWhorter has documented the Indian's autobiography with a mass of evidence and testimony that is a monumental contribution to the history of the Far Northwest. 6x9, paperback, 48 illustrations, 1 map, 328 pages, bibliography, footnotes, glossary, index.